Enables you to crop, reverse, cut, split and combine in a few clicks. Adjust the video speed up to 100x faster or 0.01x slower. Various filter and visual effects to touch up your video. Filmora9 is one of the best video editing software for beginners and semi-pros to make a causal movie or a video shared on YouTube and edit the video footage with various tools. It can effectively make your video files reverse in just few single steps. It performs one step operation and provides fast results for reversal conversion. Enables you to crop, trim, cut, split and combine in a few clicks. It is available for free download. 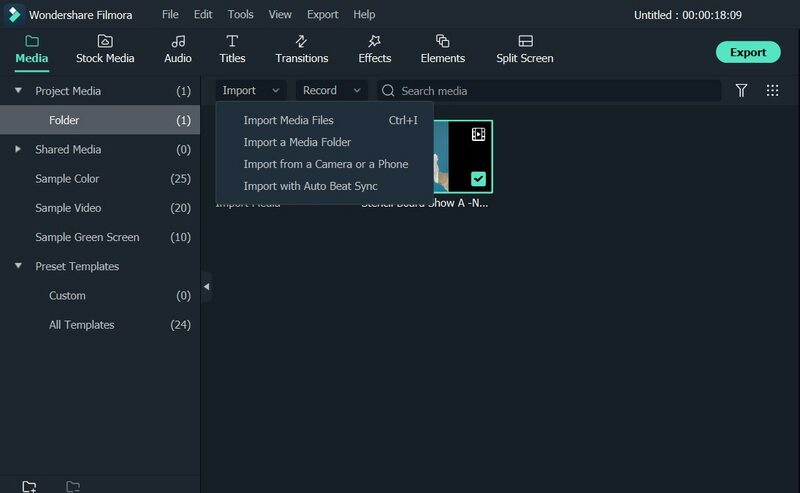 Learn from the video tutorial on how to make your videos backwards with Filmora9 and download it to try. Step 1. 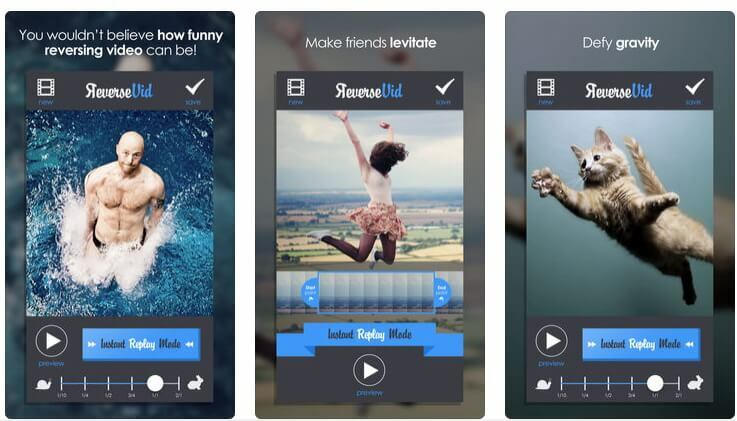 Import videos: Apply reverse effect to videos in Filmora9 is easy. Open Filmora9 and click Import media files here. Now drag it onto timeline. Step 2. Apply reverse function: Just right click the video in the timeline to select Speed and Duration option. In the Custom Speed window, check Reverse Speed option and click OK to apply the reverse effect to the video, the reverse process will start and you can see it in the Preview Window. Of course, you can also click the Speed icon in the toolbar and then click the Reverse option to playback video in reverse with ease. Besides, you can also change the reverse speed in the Custom Speed window by dragging the Speed slider to speed up or slow down the reverse playback, or enter the target duration of the reverse video in the Duration field. If you just want to reverse the playback of video and keep the audio sound as the original, you can detach the audio from the video with the Detach Audio feature in Filmora9. Just right click the video in the timeline, select Detach Audio option, the audio file will then be detached from the video and placed in the audio track automatically. After the reversed video is finished, click EXPORT. 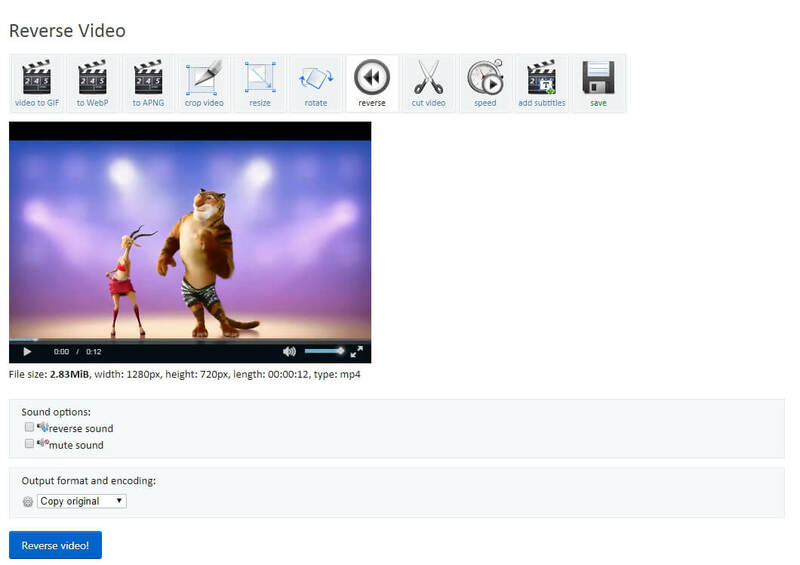 You can choose various video format including MP4, MOV, WMV and more. You can also directly upload it to YouTube platform. The most convenient part is you can input YouTube title, description and tags. iMovie is also a good choice for beginners to reverse video clips if you are using a Mac computer. You can play downloaded YouTube videos backwards and save it as a new one. To play video clips in reverse is easy in iMovie, select the target media clip in the timeline and then click the Reverse option under Speedometer tab. You can edit both videos and audios in timeline in iMovie and enhance the video automatically. The exported video can be shared to Apple devices and YouTube directly. However, iMovie lacks the supports for commonly used video formats such as it doesn’t support the AVI format. This video software creates reverse form of videos and save frames in a sequence ranging from last to first. It also provides opportunity to reverse audio signals, other than this you can also adjust size of video frames, speed up their motion or can slow down frame transitions. So with this video you can make videos very funny by adding various effects in collaboration and watch it from end to start. You can see how to reverse videos with this Video Reverser in the YouTube video below. It can work on all Windows operating systems. It supports most of the popular flash as well as video formats. This player is capable enough to reverse videos even without using typical file conversion procedures. You can playback frames in forward as well as reverse mode using this tool. This tool can also be used for adjustment as well as improvement of colours in videos. You can control the speed of reversed video playback and capture the original image size. This video reverser also offers with high speed analysis of video and you can also use the digital zoom feature to focusing on a specific area and moment. It provides high speed video camera analysis. Supports Windows 7 operating system. VideoPad video editor is an intuitive fully featured video editing software for semi-pros to create professional-looking quality video. To play the video clip in backwards in VideoPad, you need to select the video clip in sequence and then click the small Video Effects triangle icon to open the Video Effects submenu. Mark the check box for Play Clip in reverse option to play the video in reverse. You can make a reverse video with VideoPad and share it on YouTube with friends all over the world. Full transition and video effects. Works on Windows as well as Mac devices. Ezgif is a popular online animated gif maker and online video editor. With this online reverse video tool, you can add the video file (maximum file size is 100MB) from your computer or paste the video URL. After the video is uploaded, it will display the file size, the video specifications such as video type and dimensions. If there is sound coming with video, you can choose to reverse sound or mute it before reversing the video. Click the Reverse Video! Button and Ezgif will export the reversed video in the same format as the original, and you can download it after the video reversing is complete. 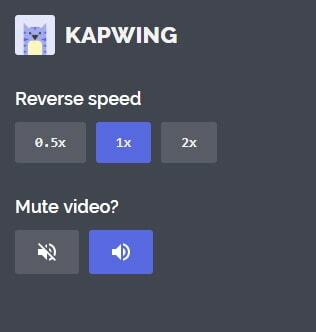 Kapwing allows you to play the video backward instantly and add a rewind effect without downloading a professional software. You just need to upload the video footage from your computer or paste the video URL to get started. This online video reverser can fetch the YouTube videos URLs, so it is a good way to use Kapwing to reverse YouTube videos directly and watch it. After uploading is completed, you can choose the reverse speed in 0.5X, 1X or 2X. Kapwing also offers the audio editing feature. So, if the video has sound, you can choose to mute the video or just keep it. After reversing the YouTube video, you need to pay a small fee if you want to save the reversed YouTube video and remove the watermark. Kapwing is free to use, but if you want to remove the little watermark, you need to pay and they offer different plans to remove the watermark. This is a free online tool to reverse the playback direction of video clips, which allows you to reverse the video as well as the audio. This online video reverser offers two ways to upload videos: you can choose a video file from your computer or paste the video URL, which makes it as a good choice to reverse Youtube videos online. It does have a wide support for video formats but the maximum file size is 10MB, which is the limitation. You can select the desired output formats including mp4, MPG, MOV, and WMV and remove the audio track or keep it as you like. This app from Bizo Mobile is available for Android and iOS and it is a simple video editing app that allows you to create a backward video with ease as well as slow down or fast forward the video speed easily. It features a user-friendly interface and you can reverse the video clip in a couple of taps. You can select any video or a certain clip from the video and reverse its images and audios. By the way, you can also use this app to record a video directly and then make it reverse accordingly. Reverse Vid is a specially designed iOS video rewind editor for backward and instant replay movies for Vine and Instagram. It allows you to slow down the video clip at 0.5X or choose the playback speed and reverse the action with Instant Replay Mode. This app also provides the feature to reverse the audio. This software has ability to implement reverse effect on videos i.e. it can create playback for videos in backward direction. You can manage all your video creation needs using this free software that is to operate with its user friendly interface. Easy to use and can handle HD videos too. It provides all edit tools for videos in one application. It is compatible iOS 6.0 and its later versions. You can install it on iPad, iPhone as well as iPod touch. This software is dedicated for Android platform; here you can create reverse effects on videos as well as can combine them to develop something entertaining. It allows you to create three separate videos from one single video. You can download it for free on Android platform. FilmoraGo is a full-feature mobile editing app, which means it can also play the video clips backwards in your Android or iOS smartphone with ease. It also features the Speed Control ability which allows you to play your clips in slow motion or create a time-lapse video at 4x faster. Besides the video speed change, you can also trim or split and add more transitions and filter to your video. Reverse video effects are gaining huge popularity from few years as it is useful in creating funny animations, cartoon movies and other entertaining effects. Some tools/softwares provide audio reversal options too whereas some can help you to mix various effects on single video or combine multiple videos with reverse effects. With Wondershare Filmora9, you can enjoy quality video reversal effects with these software tools that can work on Windows and MAC. If you want to edit audio, do not miss How to Edit the Audio Track of Your Video. Some of the video reversers allows you to save the reversed video on computer or share to YouTube, Vimeo or Reddit directly. If you are looking for a YouTube video reverser, you shouldn't miss Filmora9 video editor which provides more export and save options. Watch the videos below to check what Filmora9 can do you and have a try. I'm using the Windows version, but I think it supports the Mac version. And I found how to reverse video on Mac in https://filmora.wondershare.com/guide-mac/reverse-playback.html. Hope it helps.